SumUp vs Square: which is best for your US business? 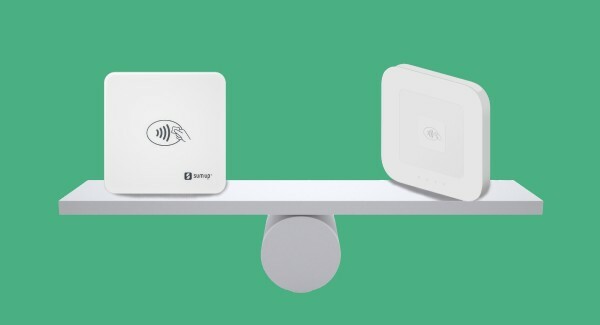 ⌂ > US > Card Readers > Comparisons > Square vs. SumUp: which is best for your business? How do the two compare in fees, features, technology and customer service? To date, Square has launched 6+ different devices for card payments. Two of these can only accept swipe: the original magstripe Square Reader with an audio jack for the older iPhones (there’s now a magstripe reader with a plug for newer iPhones) and Square Stand. Square’s initial response to EMV was a chip card reader for swipe and dip. It later launched the Square Reader for chip and contactless, featured in our table above. To accept swipe, chip and contactless, you need to have two devices – unless you use the pricier Square Terminal which isn’t made for carrying around. Yes, it is rather confusing. SumUp makes things easier with one terminal for all card types. The company has handled chip payments for several years already, and its EMV experience shows in the device. Both SumUp and Square meet the PCI Data Security Standard (PCI-DSS). See also: SumUp credit card reader – has Square finally met its match? Square charges 2.75% per swipe, chip dip or contactless tap via one of the Square Readers. SumUp charges just 2.65%. None of them have additional fees for foreign cards. There are no monthly fees either, although Square has a number of optional tools available for a monthly cost. For an additional 1% added to the card fee, Square can deposit transactions in your bank account the same day – this is called ‘Instant Deposits’. Keyed-in transactions are not possible with SumUp, but Square offers these higher-risk payments for 3.5% + 15¢. Square also lets you accept invoice payments for 2.9% + 30¢ each. Square generously offers up to $250 chargeback protection per month as long as you follow what they consider best practice. SumUp charges $10 per chargeback, which is lower than the typical industry rate of $25, although not as attractive as the protection Square offers. Refunding payments is free if done straight away, but beyond that, there are differences. Square allows free refunds up to 120 days after the transaction, so the customer can get the full, partial or itemized amount back and you get the transaction fee refunded yourself. With SumUp, once the transaction has been deposited in your bank account, SumUp will keep the transaction fee – and you can only refund the amount (full or itemized) if there is currently enough balance (outstanding payouts) in your SumUp account. You get a perfectly functioning app with SumUp – it’s just not as feature-rich as Square Point of Sale. There’s a user-friendly product catalogue in the SumUp app where you can enter product details and images, but you can add more attributes in Square’s product library. Add several user accounts for a team of employees with both SumUp and Square, and send text and email receipts after payments or integrate with compatible receipt printers. With Square, you can add timesheets and set advanced user permissions too, but this comes at a monthly cost. In fact, a lot of extra features are available with Square if you can afford it, such as gift cards, payroll and an appointment system for beauty salons, hairdressers and other service-oriented merchants. That being said, the free Square app already comes with a great deal of features and backend tools. The SumUp app is efficient if you sell fairly straightforward products or services, and in-person only. Square can send invoices from the app and process keyed transactions, which SumUp does not. If you own a coffee shop, restaurant or food truck, Square Point of Sale has more to offer. SumUp does not support split tenders, open tickets or tipping in the app. So if you are opening a café or quick-service restaurant, the choice is easy. Add to that the newly launched Square for Restaurants POS plan – but this comes at a monthly cost ($60). The point is, if you’re starting out with rapid growth in mind, the option is there to expand the free Square app to more advanced, industry-specific software. The Square ecosystem has grown rapidly in recent years, but many of the services come at a monthly cost. You can add gift cards, payroll, appointment management, e-commerce and even get a small-business loan – the list is long, and many businesses are happy to stay in the Square family of services. If you just want no-frills, in-person card payments, SumUp will do that at a slightly lower card rate and with a cheaper, more convenient card reader that accepts all the cards you need. MobileTransaction.org may make money when you click on banners or links in text. Our editorial staff write reviews independently.